The main market of the Jamaica Stock Exchange major indices suffered sharp lossesat the close on Monday, with the market having another day of big volume. Main market activity ended with 22,820,352 units valued at $1,138,660,815 compared with 34,337,150 units valued at $729,254,221, on Friday. At the close, the All Jamaican Composite Index dived 8,017.57 points to close at 406,165.98 and the JSE Index plunged 7,297.03 points to close at 370,071.16. Adjustment to the average price of NCB Financial compared to that on Friday, was the major contributing factor to the sharp correction to the indices with the JSE reported closing price being $142.81 versus $148.99 on Friday as opposed to the last traded price of $145 on both days. The main and US markets traded a total of 32 securities, with prices of 10 rising, 11 declining with 11 remaining unchanged, compared to 33 securities trading on Friday. Sagicor Group led trading with 5,552,292 units for 24 percent of the day’s volume, followed by Scotia Group with 4,982,116 units and accounting for 22 percent of the total main market volume changing hands, NCB Financial Group traded 3,598,470 shares and 15.8 percent of main market volume. 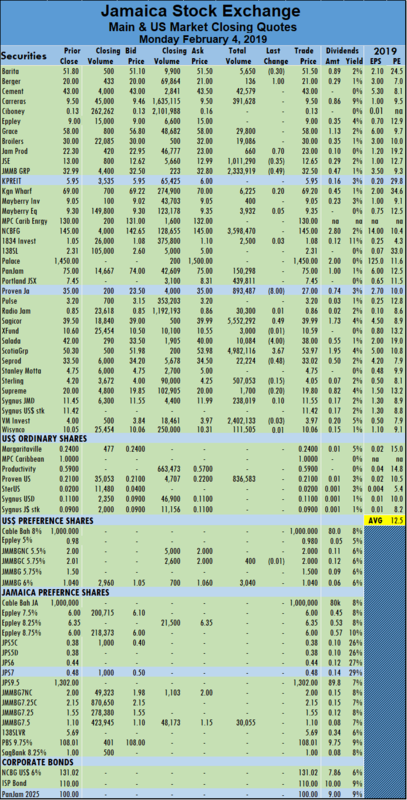 Also trading in large volumes are, Victoria Mutual Investments with 2,402,133 units, JMMB Group exchanging 2,333,919 shares and Jamaica Stock Exchange with 1,011,290 shares changing hands. IC bid-offer Indicator|The Investor’s Choice bid-offer indicator ended with the reading showing 10 stocks ending with bids higher than their last selling prices and 2 closing with lower offers. The reading is far less bullish than the reading at the close of Friday, of 15 to 2. 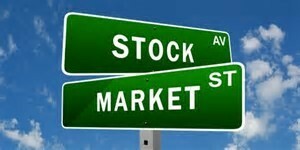 An average of 786,909 units valued at $39,264,166, in contrast to 1,107,650 shares valued at $23,524,330 on Friday. The average volume and value for the month to date amounts to 952,625 units valued at $31,131,917. Trading for January resulted in an average of 101,980 units valued at $3,042,494, for each security traded. In main market activity, Barita Investments lost 30 cents in closing at $51.50, with 5,650 shares changing hands, Berger Paints gained $1 to end at $21.00, with just 136 stock units trading, Jamaica Producers rose 70 cents to close at $23, with 660 shares changing hands. Jamaica Stock Exchange closed trading with 1,011,290 units changing hands compared to 2,677,014 units on Friday with a decline of 35 cents to $12.65, JMMB Group fell 49 cents to close at $32.50, trading 2,333,919 shares, Proven Investments dropped $8 trading 893,487 units to close at $28. Sagicor Group rose 49 cents trading just under 5.6 million stock units, to close at $39.99, Salada Foods dropped $4 to $38 in trading 10,084 units, Scotia Group climbed $3.67 and finished trading of 4,982,116 shares at $53.97 and Seprod lost 48 cents to end at $33.02 with an exchange of 22,224 shares. Trading in the US dollar market resulted in 840,023 units valued at $179,653 changing hands. 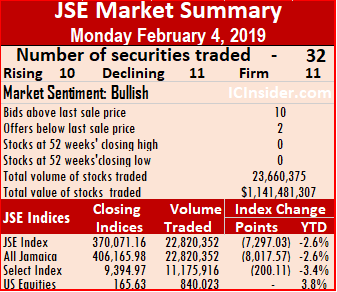 JMMB Group 5.75% preference share traded 400 units at US$2, JMMB Group 6% preference share concluded trading of 3,040 units at US$1.04 and Proven Investments traded 836,583 units at 21 US cents The JSE USD Equities Index closed unchanged at 165.63.